AFRICANGLOBE – The case of Libya today as an example of a failed state is beyond doubt with rival splinter groups tearing each other apart and dismantling a once vibrant economy well manned by Gaddafi. The Libyan Coast is now left wide open to dinghy boats captained by many Captains Unscrupulous who are willy-nilly cashing it big time while putting people’s lives in danger. The EU and USA failed Libya by sanctioning the killing of the Muammar Gaddafi and unfortunately they have to deal with the consequences of their actions. South Africa and Nigeria should hang their heads in shame for voting for UN Resolution 73 authorising military action against Gaddafi. Now Europe is in limbo because as soon as migrants reach the shores of Europe they can never ship them back under the auspices of a UN 1951 Convention and the convention state that ‘no country is allowed to turn away or turn back any refugees forced to flee their own country’. So the only other option Europe has is to let people drown. This is the real dilemma of EU and US foreign policy blunders. There is no going round the fact that Libya is in state of political, social and economic malfunction. The EU and USA have to take direct responsibility for their part in the outcome of their brazen and callous public execution of Gaddafi who was the glue that bound Libya and beyond together. When Gaddafi was at the helm Libya was a destination for most migrants from Africa and the Middle East. Today Libyan ports are transit points and many a Captains Crooked people smugglers are having the last laugh. Many migrants are prepared to part with their hard-earned life savings and brave the treacherous seas on makeshift boats to reach European shores for what they imagine to be better lives. It is totally understandable because it is probably better to die on the open seas than return to their port of exit which is often their home countries. Gaddafi and a stable Libya provided the first concrete barrier against people smugglers along the Mediterranean Sea (literally speaking of course). Prior to his untimely murder Gaddafi was negotiating a £4 billion a year package with the EU to help them curb immigration across the Mediterranean. The EU and USA miscalculated and underestimated the critical role Gaddafi played in securing exit points along Libyan shores and today their meddlesome foreign policy has left Libya in the hands of some very unstable and unsavoury characters. 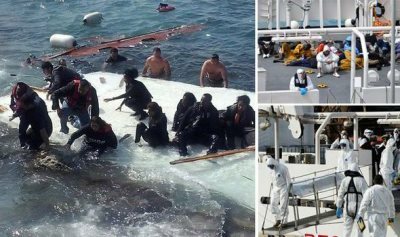 The EU has been witnessing the actual outcomes of their destabilization tactics in Libya with little dinghy boats making futile attempts at crossing the Mediterranean Sea daily. Many lives have been unnecessarily lost and more recently over 900 people perished when the overloaded boat they were crammed up in curved in. There has been some intriguing revelations as the election campaign in the UK has been heating up with the Labour leader Ed Miliband accusing British Prime Minister David Cameron and other EU/USA leaders of being ‘directly responsible contributing to the death in the Mediterranean’ due to their involvement in Libya and failure to formulate a post-conflict plan after the killing of Gaddafi. Under Gaddafi Libya was a solid and stable state run in an efficient and orderly manner. Since 2011 Libya has had a total of 5 different governments all who have failed dismally and plunged the country further into chaos and confusion. In comparison the one stable government of Gaddafi provided security and stability, free education and health, super infrastructures and the best facilities on the African continent. So this is the democracy that the so-called rebels in Libya who fronted the killing of Gaddafi were fighting for during the carefully choreographed and Western orchestrated so-called Arab Springs? It makes one wonder about the intentions of the “International Community” (EU and USA of course) and their couriers who often happen to be the marionette and handheld opposition political parties who front the concealed capitalist agendas of the self-serving ‘International Community’. Developing countries should value the order and peace that prevail in their countries because that order and peace came from none other but them. It is easy to be swayed by the illusory promises of better things and democracy which means absolutely nothing in the middle of chaos as seen in Libya of today. The EU immigration crisis on the Mediterranean Sea brings to the fore the flawed and ruthless nature of the EU and USA foreign policy. Lets start by giving credit to the EU for tripling funding for patrols in the Mediterranean Sea to help stranded boats and kudos to them. However the reality is that it is a crisis they created as Ed Miliband rightly pointed out to David Cameron and they have a responsibility to the victims of the mayhem and chaos they have created with the killing of Gaddafi and the destabilisation of Libya. But then they all seem reluctant to accept the migrants into their countries. Britain has made it clear that it will not be accepting any refugees rescued from the boats on the European shores and other countries have stated that they are unable to cope. It is a crisis of epic proportions with no solution or end in sight. It is very easy to lay the blame of the migration crisis in Europe and in South Africa on African governments but the real root cause that is often deliberately swept under the carpet is the self-serving foreign policy of the EU and USA. Many African governments and their already struggling economies are left fragmented owing to the interfering hand of the more developed nations of the west. We have witnessed it in Iraq, Egypt, Ukraine, Syria, Libya and many other places where chaos continue to reign in the aftermath of western interference. Those that resist the interference are immediately slapped with economic sanctions as seen in Cuba, Iran, North Korea, Zimbabwe, Venezuela and many others too many to mention. The script is always the same about ‘dictators, democracy and protecting civilians from their bad leaders’. The question to ask today is if you look at Libya today, who really is the bad leader there? This is food for thought. The solution to the current crises lies in the EU and USA reviewing their foreign policy agendas in the developing countries. They need to allow developing countries to develop their economies independently without any interference to further their own capitalist agendas. Zimbabwe is a stable country that has been under economic sanctions for the past 13 years and the economy remains in doldrums. The excuse for the continuation of these draconian economic sanctions is the over-used and misused mantra of ‘Mugabe dictatorship, bad governance, democracy and lack of rule of law’, all which are nothing but a red herring fallacy to cover up the regime change agenda overtures. Many developing countries find themselves wading deeper and deeper into debt and borrowing more to keep it all together for their impoverished and expectant masses. It is a vicious circle where they borrow more and pay out more to service such debt and remain permanently in the financial red. It is the sure case of a Wonga payday loan where one literally set up a direct debit of the whole salary weekly. It comes in and goes out and when it does not go out the interest rate is 1000 percent. It is a man-made crisis and a direct result of flawed foreign policy and economic manipulation of developing countries by the more industrialised countries of the west in their quest to control the abundant natural resources of the less developed economies. This crisis and the meddling tactics of the industrialised countries manifests itself in scores crookedly dangerous boats on the Mediterranean Sea, the proliferation of far right groups in Europe such as Golden Dawn in Greece, and the anger and resentment continue to simmer in deep-rooted contempt and irrational fear and hatred for migrants with the likes of the Katie Hopkins of this world branding them as cockroaches and the beheading and burning of foreigners in South Africa. There is a sense of denial in terms accepting responsibility and accountability for the Mediterranean Sea immigration debacle and the chaos the EU actions created in Libya. The bottom line is that the EU/USA have to take full responsibility and now they can actually ‘protect civilians’.